Having been on the road for the last two weeks and losing all four games, Jackson Cressey and his teammates on the Princeton University men’s hockey team were happy to be back at the friendly confines of Hobey Baker Rink. 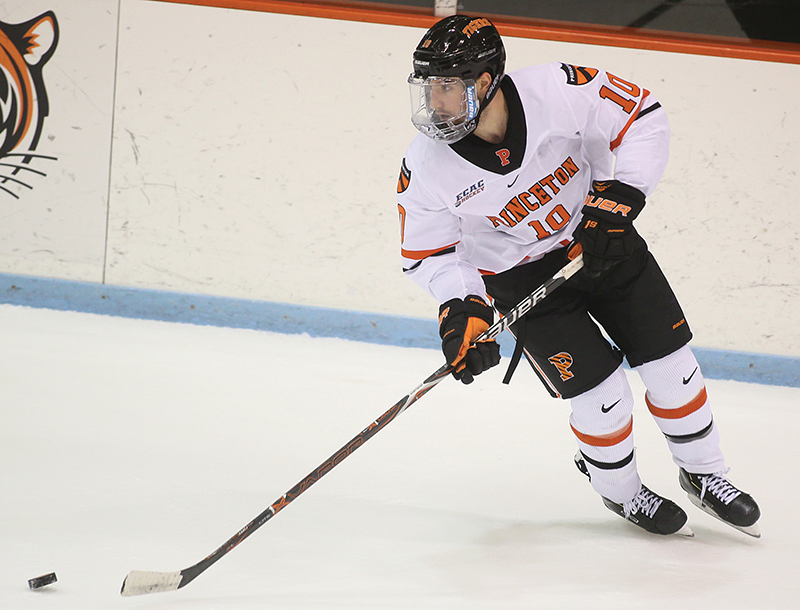 Hosting Quinnipiac last Saturday evening, Princeton jumped out to a 1-0 lead in the first period as junior forward Cressey took A feed from senior defenseman Josh Teves and found the back of the net. “Teves just made a great play; he broke through the zone all by himself and beat a guy to the wall,” said Cressey. In the second period, Quinnipiac made some great plays, outscoring Princeton 4-2 on the way to a 6-3 win over the Tigers, who suffered their fifth straight loss and dropped to 3-6-1 overall and 3-3-1 ECAC Hockey. While Cressey was disappointed with the result, he drew positives from Princeton’s performance. “We have been in a little bit of a skid lately so coming back home we were looking for a better result than that,”said Cressey. When Cressey scored a goal late in the second period to cut the Bobcat lead to 4-3, he thought the Tigers might be on track for a positive result. Entering the night with just one goal on the season, Cressey is hoping that his two goal effort can get him on a roll. Princeton head coach Ron Fogarty concurred, seeing an offensive spark that has been missing in the last few games for the Tigers. “We got some goal scoring, which we have been struggling to,” said Fogarty, whose team fell 3-0 at Quinnipiac in the opener of a two-game set between the rivals. The Tigers are not enjoying things, mired in a five-game losing streak. With three months left in the regular season, Fogarty believes his team will get on the right track, drawing confidence from its playoff run last winter which saw it win the ECACH tournament. “Our guys work really hard, they are very resilient and winning is difficult,” said Fogarty, whose team hosts Arizona State for a two-game set on December 7 and 8. In Cressey’s view, Princeton has what it takes for another big stretch run. “I think it is just having all 27 guys on the same page, putting in a full effort every night,” said Cressey.